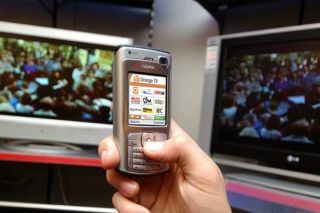 In a major deal announced today, you'll now be able to watch and listen to BBC channels on your 3G mobile. The experimental 'mobile syndication' service will be available for Orange, 3, Vodafone and 3G customers. The trial, that will begin within the month and last up to a year, will see BBC One, BBC News 24 and BBC Three streamed via 3G mobile TV platforms. Customers of the partner networks will also be able to listen to Radio 1, 1Xtra, Radio 2, Radio 3, Radio 4, 6 Music BBC 7 and Asian Network. The channels will be streamed as live to subscribers, but not all of the BBC's TV shows will be included - some shows acquired by the BBC will not be shown on the mobile TV service owing to rights issues. BBC Radio 5 Live, for example, is not part of the deal because of its extensive portfolio of sports rights. A spokesperson for the BBC told Tech.co.uk that the trial service would not be offered free to all 3G phone users, but would be included as part of existing mobile TV subscription packages offered by the mobile phone operators. However, it is expected to be included as part of the lowest pricing tier of service bundles offered - usually starting at £5 a month - and as such no additional network data charges will be incurred for using the streamed services. Vodafone and Orange are expected to be the first to launch the BBC services, with 3 following towards the end of April, according to the spokesperson. The BBC is using the trial to establish consumer reactions to watching TV via 3G streaming and announced the news at the Broadcast Mobile TV Congress. Ashley Highfield, director of Future Media and Technology at the BBC, explained: "By making a range of television channels and radio networks available to 3G mobile phone subscribers, we hope to test not only the effectiveness of 3G as a means of distribution, but also how audiences respond to the BBC's linear services on their mobiles. "The findings, combined with quantitative and qualitative consumer research, will inform the BBC's future mobile strategy." Not to be outdone, moments after the announcement Sky contacted Tech.co.uk to remind everyone its channels are available on a similar service with Vodafone - launched in November 2005 - and will soon be available on 3. Separately, the BBC has also launched an enhanced version of bbc.co.uk/mobile, available to all mobile phones with browsers capable of displaying XHTML pages. The navigation and design has been improved, while there's a redesigned BBC Weather featuring Radio 4's The Shipping Forecast.